Preparing students for the success in the world after graduation includes providing training and technical assistance to districts in transition planning, inter-agency coordination, school/business partnerships, and job coaching. Our staff is able to address issues related to graduation requirements, course development, and program participation. Transition assessment is a required component of transition services for students with disabilities according to IDEA. As a result of HB 617 from the 83rd Texas Legislature, each local education agency (LEA) or shared services arrangement (SSA) is required to designate at least one employee to serve as the designee regarding transition and employment services for students receiving special education services. To find contact information for a transition employment services designee or to access the list of transition and employment services designees, click here. New online courses are available on the Transition in Texas website. These courses are available to the public at no cost. Course registration is simple, but will require accessing the ESC Region 11 course catalog and Canvas portal. See below for options, and feel free to contact me with questions. 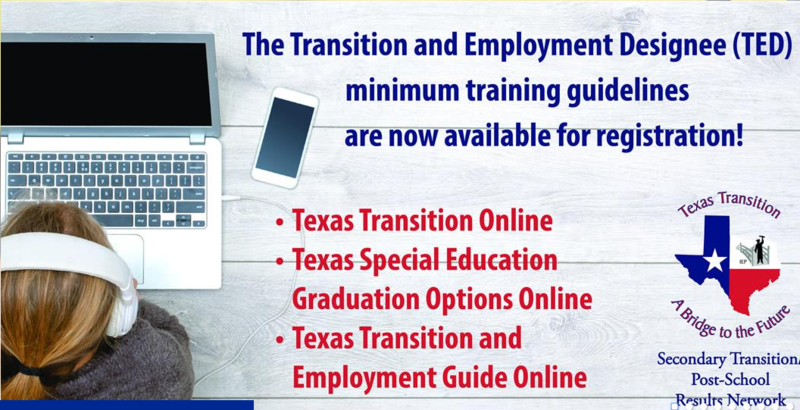 The Texas Transition and Employment Guide can be found here:The Texas Transition and Employment Guide includes information about self-advocacy, transition services, employment, Social Security, community supports, postsecondary education and training, state agencies, and alternatives to guardianship. 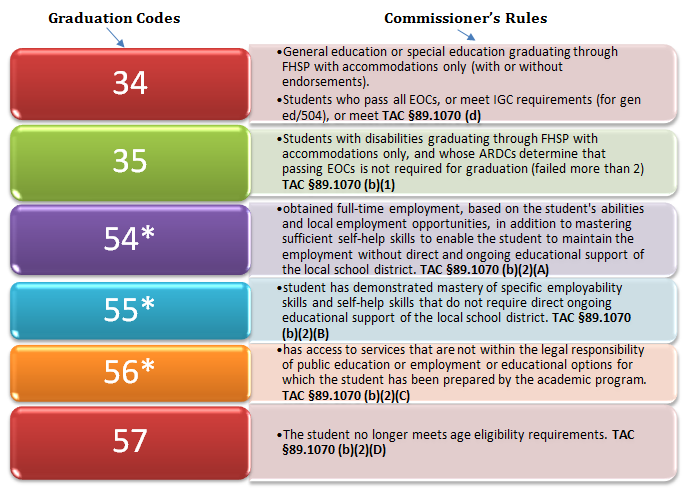 The State Performance Plan (SPP) for Indicator 13 measures transition planning for students age 16 and above. This data must be reported annually to TEA. For more information about this indicator, please click on the information below. The State Performance Plan (SPP) for Indicator 14 measures postsecondary outcomes within one year of leaving high school for students who had an IEP in effect at the time of graduation. This data must be reported annually to TEA. Self-determination is an important part of transition for students with disabilities because it provides the skills and tools necessary to allow students to make their own choices and decisions about their lives. Self-determination instruction should start in elementary school and continue until a student graduates from high school. What are 18–22 programs and services? 18–22 services are transition services available to students ages 18–22 who have completed all credit/curriculum/state assessment requirements and will be graduating under option 89.1070 (g)(4)(A-C) or (b)(2)(A-C). program is an age-appropriate instructional environment where the student is provided education services in their community. Who is eligible? Students receiving special education services who are ages 18–22 who have completed all credit/curriculum/state assessment requirements and will be graduating under option 89.1070 (g)(4)(A–C) or (b)(2)(A–C) and require additional transition services in order to meet the requirements for graduation. Are flexible schedules allowed? Yes. All transition services and programs for students ages 18–22 who are receiving special education services should be individualized based on the student’s specific postsecondary needs relative to a successful transition to their adult life. Attendance should be documented based on the options available in the StudentAttendance Accounting Handbook(e.g., ADA Code 1—Full-Day Attendance, ADA Code 2—Half-Day Attendance, ADA Code 0—Enrolled, Not in Membership). All students who receive special education services must meet the graduation requirements of their high school plan in order to graduate with a diploma in Texas. More information about graduation for students receiving special education services can be found in the Live Binder here. (B) supports and services to foster the student's independence and self-determination, including a supported decision-making agreement under Texas Estates Code, Chapter 1357. Vocational education means organized educational programs that are directly related to the preparation of individuals for paid or unpaid employment, or for additional preparation for a career not requiring a baccalaureate or advanced degree. (3) are enrolled and receiving individualized education program services.